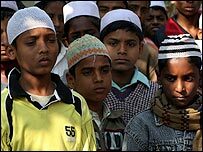 It is a typical nondescript village - like many others - in the northern Indian state of Bihar. It consists of unplastered brick houses, dusty lanes, thatched structures and dirt-laden children with no shoes and running noses. There appears to be little running water or other infrastructure. But there is one thing about the village of Lakhanow - and other settlements in the area - that makes them strikingly different. Ejaj Alam - a small-time civil contractor in his mid-30s - provides the answer: he has decided to re-name his three-year-old son. Instead of being called Majhar Alam, Mr Alam has opted to call the boy Saddam Hussein in honour of the former Iraqi leader who was executed on 30 December. What is more, the child will not be the only Saddam Hussein in the neighbourhood. There are more than 20 other Saddam Husseins in Lakhanow alone. Local people say there are more than 100 Saddam Husseins in 27 adjoining villages dominated by mostly Sunni Muslims. There is even a family with one son called Saddam Hussein and a younger sibling called Osama Bin Laden. Perhaps it is no coincidence that all the children bearing the name of Saddam Hussein were born after the first American war with Iraq in 1991. Before the war, the name Saddam Hussein was hardly used at all, says Mohammed Nizamuddin, whose grandson was born in 1991 and is called Saddam Hussein. And, now after the recent high-profile and much photographed execution of the Iraqi leader, the villagers of Lakhanow have decided to name all the new born baby boys after him. "This is our way to pay tribute to our leader. We want to carry on his legacy here at least in our village," said Ejaj Alam. "God willing one day our village will be full of Saddam Husseins." Other villagers feel equally passionate about the issue. "George Bush can hang one Saddam Hussein but we will create an army of Saddam Husseins. Let him come to our village and see how Saddam Hussein can never be executed," local leader Ayub Khan said. There is no talk here of the former Iraqi leader's appalling human rights record, no mention of the people he murdered and no references to his numerous "miscalculations". All that is brushed aside by the Saddam Hussein personality cult. Close to the village is the only private school, Dini Academy, where almost 100 Saddam Husseins come to read, write and know more about the former Iraqi leader. "It was during the Gulf War we came to know about the bravery and valour of the Iraqi president who mustered courage to defy American diktats," Mr Nizamuddin said. The villagers make no secret of the fact that the American president is not their most admired personality. 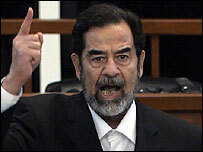 Most argue that Saddam Hussein has been "immortalised" following his execution. Many may have only scant knowledge of who Saddam was, but that does not stop them believing propaganda which confers him with almost God-like status. So what do the new Saddam Husseins think about their name changes? The signs are that they have been told what to think from an early age. "I feel extremely proud being named Saddam Hussein. He was a great leader, a lion who took on the might of America and became a saviour of the weak," said one "Little Saddam" born in May 1993. "I too would like to be like the Iraqi president and die a death like him." Another Saddam - born in May 1992 - says proudly that he "will try and live up to name of the great warrior". Yet another calls Saddam Hussein a "dear leader". The eldest Saddam Hussein in the village - born soon after the first Gulf war - appears the most vociferous. "I owe a great debt to my father for naming me after our revered leader. It was only after his execution, when news and photographs appeared in the newspapers that I came to know how great he was," he said. On the day of the execution, all the Saddam Husseins of the area congregated in the village mosque to pray for his soul. Then they staged a procession and burnt effigies of George Bush. But there is one problem in having so many Saddam Husseins, says villager Mohammed Hassan Abbas.